This is a post from my other blog. It was mostly dedicated to beer reviews, so I thought it would be better placed here. It's also about a very popular yeast farmhouse brewers like to use. What's up everyone and Happy Homebrew Wednesday. 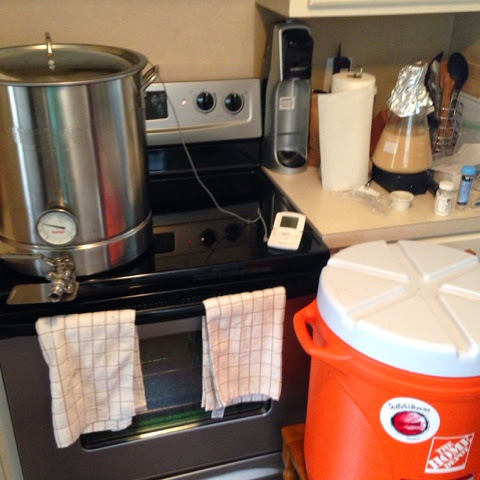 This past weekend I was able to get another brew going with a yeast that I've been very anxious to work with. Being a huge fan of Saison/Farmhouse style beers, I picked up a couple vials of the Wallonian Farmhouse Ale yeast from a new-ish yeast company in California. The Yeast Bay came out swinging with a bunch of awesome boutique yeasts that a ton of people have been raving about. I had to get in on that. I modified my standard Saison recipe to accomidate some of the descriptors I read about the Wallonian yeast. My simply Pilsner, Wheat, and Acid Malt grist would have worked fine I'm sure but I wanted to add a little something extra in there. Below is the recipe I came up with. Notes: Gallon was kept to the side for use on starters. I mashed much higher than I normally would for brewing a Saison. 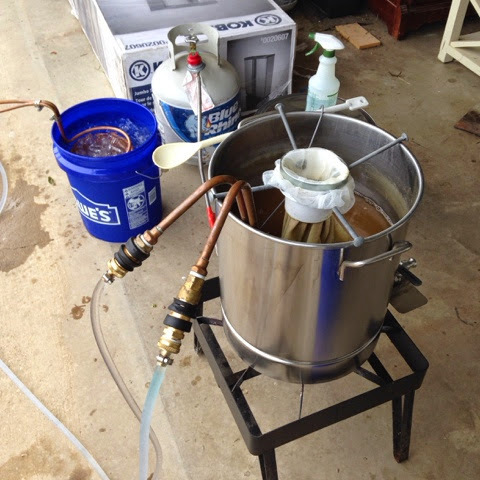 I usually mash around 148-149F to get the beer to attenuate as high as possible and get good and dry. After reading the description and seeing some reviews I decided to bump this up to 154F and get some residual sugars left in the brew as it seems to be a pretty aggressive yeast. I also added in the Munich and Vienna Malt to give the beer another profile of sweetness and sugars for the yeast to chow down on. Two days before brew day I made up a simple 1.040 starter of Light Pilsen DME and 1200ml of water. Pitched the yeast in there and let it spin. I had an entire flask of milky yeast goodness going when I got up on the morning of brew day. I was sure there was plenty of cells in there to take down my target 1.061 OG. Everything went well in the mash and I held the temp of 154F for 75 min. Grabbed my first and second runnings and headed to the burner. I wanted to keep a simple hop bill as well to give the yeast plenty of room to shine. 2oz of Hallertauer for 90 min an done aroma addition of .5oz at 5 min were all I needed. I did add yeast nutrient at 15 min. Boiled down to 7.5 gallons (roughly) from 9 gallons I had collected and my gravity was 1.064. Just slightly higher than my target but that's fine. 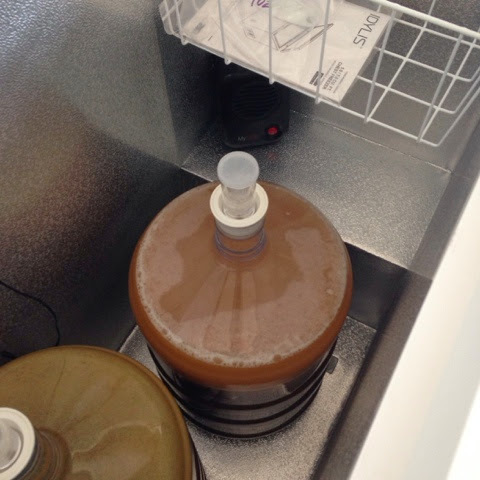 I cooled the wort down to 75F and pitched the entire 1200ml starter into the fermenter. I put the carboy into my fermentation chamber set to 68F and I'll let it sit there for 48 hours before I pull it out. I'm going to let this beer finish at room temperature in the house. This should help the yeast chew through the wort. I've been looking forward to this brew day with this yeast for a long time I'll post updates for this brew as it goes a long. After two days I took it out if the 68F fermentation chamber and let it sit at room temp. That yeast is blazing through the wort! When the beer reached dryness (1.000!) I bottled with 5oz of dextrose. I noticed the caps popping after I had all the beer in bottles waiting to cap. The yeast was already working on the priming sugar! My first bottle reflected this. In two weeks I had full carbonation. Nice hiss and pop when I pry the cap off. At close to a year, I've had this beer many times. Fresh it was very much like the description of the yeast on the website. Very earthy, some spice, a little bit of tartness and a different smoky/funky flavor. It was very interesting. Citrus notes and hints of grass seem to come through as well. I really liked it! The one flaw I felt it had was a little too much sweetness. Even at 1.000 gravity. This could be due to my malt choices and mashing much higher. Maybe boiling the 90 minutes after mashing at 154F created too many caramel flavors. Now, right at 11 months since brewing, it seems the beer has taken on much different flavors. It's very Belgian-esq in that it tastes almost like a light Dubbel. There is a candy sugar flavor that dominates most of the profile. The aroma really resembles a Belgian Dubbel. Sweet candy, hints of caramel and a little spice. The tartness and hint of smoke/funk are all but gone. No real citrus present either. Very interesting how it has changed. I'm going to pick up a fresh vial and try my favorite saison grist with it. Take out the Munich malt and replace the Pilsner with the Pale Ale malt. This could also probably benefit from some Brettanomyces additions. I'll split off a batch and let it go. You know... You are probably right about that! For some reason I had never thought about that!